This book has become a “classic” in helping businesses promote themselves online. Although it has “SEO” in the title, do not be fooled. It is about much more than “search engine optimisation”. Instead, this book takes you through everything you need to do in order to get your website noticed by search engines and clicked on by searchers. 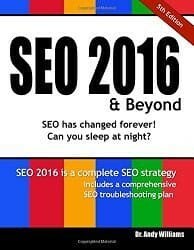 In more than 200 pages “SEO 2016” shows you how to complete ten steps to perfection for search engine marketing. Those steps include checking the structure of your website as well as the way you use social media – both have an impact on how well you perform in search engines. This book is well-written and easy-to-read and is packed full of up-to-date tips on getting your website noticed. Furthermore, SEO 2016 includes the latest changes form the likes of Google, so that you can prepare your website using the latest search engine requirements.